The other day, since Jeff was out-of-town for a speaking engagement, I found myself faced with the prospect of dining alone. This was quite an opportunity, I realized, to see if I was all talk and no action, and if in fact I was true to my word. Last month I had the distinct honor of speaking to the James River Women's Club. Their chosen topic was "cooking for one" which, obviously, isn't something I have very much call to do these days, however, like most things, it's something about which I have strongly held convictions. I told them, amongst other things, that life is too short to eat a bad meal. I told them that just because one is alone, it is no reason not to set the table properly and make an occasion out of it. Furthermore, the great news about cooking for oneself is that you never have to eat anything you're not in love with eating, which is where the cauliflower cheese comes in. What I didn't tell them is it's a great excuse to make something you adore and, as my mother would have said, make a total greedy guts of yourself, which is what I proceeded to do with the cauliflower cheese. I love cauliflower cheese. There, I've said it. It clearly goes back to my boarding school days in England where I was, at times, what I think could be called a situational vegetarian. That is to say, I ate the meat when it was something I liked, say roast beef or roast pork, and didn't if it was something I couldn't stand, like grey slabs of something that was purportedly meat but was of indeterminate origin. For some reason, at Bedales in those days, more often than not, the vegetarian option seemed to be cauliflower cheese which seemed, even though it wasn't a particularly great rendition of this divine veggie, to be hugely preferrable to the aforementioned grey slabs. I think I must have eaten a lot of it in those days, and for some reason, it wormed its way into my heart as my ultimate comfort food. It has everything going for it when you come right down to it. It's quick and easy, hot and delicious, is an actual vegetable (which makes you feel erroneously virtuous) and is bursting with cheesy-goodness. I mean, what's not to love? Anyway, I'm pleased to report that I ate it at a properly laid table, without the television on. I listened to some John Coltrane and thought about my beloved friends with whom I shared those many meals in the midst of the Hampshire countryside. I admit that it's the only thing I ate for dinner that night, though certainly one can pair cauliflower cheese with any number of things for a properly balanced meal. Yes, I dined by myself, but my goodness, you wouldn't believe the raucous company I had in my head. And no, Mother, I didn't eat the whole thing. Note: This is a very touchy-feely recipe so add more or less cheese and milk to get the sauce to the consistency and cheesiness that suits your preference. Put a large pot of water, fitted with a steamer insert, on to boil. Place cauliflower into the steamer, and when it comes to a boil, put a lid on top and cook for about 10 minutes until it is soft but emphatically not overcooked or, heaven forbid, mushy. 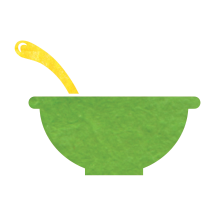 While it's cooking, melt butter in a large saucepan and add the flour stirring to combine. Allow to cook for about 2 minutes so the raw flour taste won't be present in your bechamel sauce, and then start to add milk about 1/4 cup at a time, stirring constantly until the sauce seems to beabout the right consistency. Add the mustards and nutmeg and start to add the cheese, stirring constantly until it melts and is the consistency you want. You may add more milk to thin it if necessary. Do not boil the sauce, and remove from the heat as soon as it's ready. 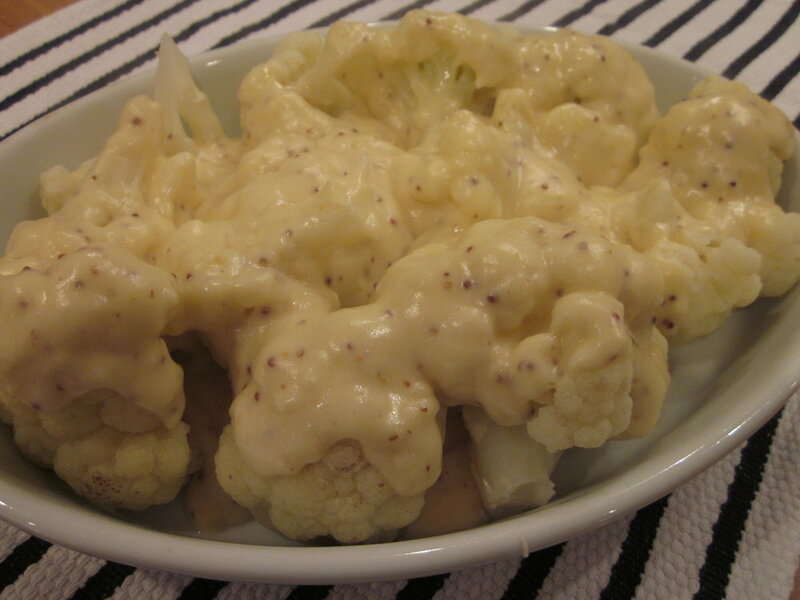 Place drained cauliflower in a casserole dish and cover with the cheese sauce. Serve immediately.